I was having breakfast with Lola when Jen called to meet her at the parking lot coz she has something for me and needs help. I was so excited to know what it was and my excitement was justified because she had two herb planters for me. Spearmint and rosemary- two of my most coveted herbs and the funny thing is, she got the spearmint from Lola's garden. 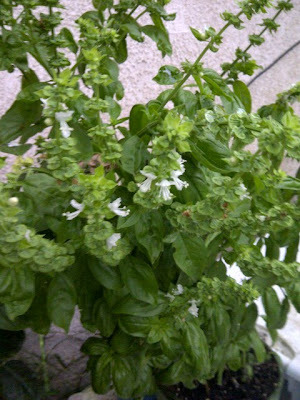 Yes, clueless Lola had the precious herb in her garden without her knowledge. 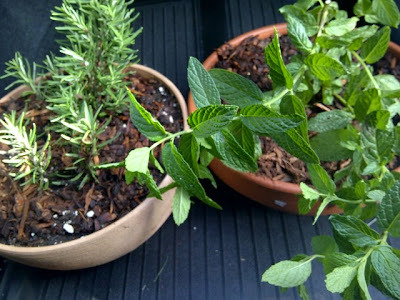 Anyway, my dream of having a little ensemble of herb planters is slowly becoming a reality- thanks to Jen! And since we're on the subject of herbs, my organic basil is still growing and right now it has a lot of flowers. I will be really sad when it finally say goodbye in a a month or so. Jen told me herbs don't last that long. Still, I will remember it for all the pesto it gave me and a lot of beautiful leaves to garnish my pasta.